2nd Lieut. Residence: Charlestown; salesman; 27; comm. Aug. 6, 1862; must. Aug. 10, 1862; comm. 1st Lieut. July 20, 1863; must. Aug. 16, 1863; must. out June 6, 1865 as 1st Lieut. must. Aug. 10, 1862; wounded July 2, 1863; Gettysburg, Penn; comm. 2nd Lieut. from 1st Sergt., Dec. 17, 1864; must. Jan 8 1865, comm. 1st Lieut. Jan. 1, 1865; must. Jan. 28, 1865; must. out June 6, 1865 as 1st Lieut. must. out June 6, 1865.
must. Aug. 10, 1862; must. out June 6, 1865 as Corporal. John A. McCarty #1 Priv - Res. Troy, NY; moulder; 21; enl. July 23, 1862;must. Aug. 10 1862; wounded July 2, 1863; at Gettysburg, Penna. ; transf Sept. 30, 1864, to V.R.C.;disch. July 13, 1865, as of Co. "B" 3rd V.R.C. Charles A. Guinn #2 Priv. - Res. Cambridge; barber; 22; enl. Aug. 5, 1862;must.Aug. 10, 1872; must. out June 6, 1865.
enl. July 18, 1862; must. Aug. 10 1852; must. out June 5, 1865 as Corpl. John H. Sullivan #4 Priv. - Res. Somerville; clerk; 20; enl. Aug. 4, 1862; must. Aug. 10, 1862; must out June 6, 1865, as Corpl. John W. McDonald #5 Priv. - Res. North Easton; shovelmaker; 18; enl. July 25, 1862; must. Aug. 10, 1862; must. out June 6, 1865. Walter Lee #7 Priv - Res. Boston; blacksmith; 28; enl. July 29, 1862; must. Aug. 10, 1862; must. out June 6, 1865. Pvt. - Res. Boston; painter; 26; enl. Aug. 7, 1862; must. Aug. 10, 1862; wounded July 2, 1863, Gettysburg, Penn; must out June 6, 1865. Samuel C. Glover Swing Priv. - Res. Quincy; bootmaker; 20; enl. Aug. 1, 1862; must. Aug. 10, 1862; must. out June 6, 1865. Nathan H. Brand Wheel Priv. - Res. Melrose; teamster; 25; enl. July 31, 1862;must. Aug. 10, 1862; must. out June 6, 1862. Horace Prescott Lead Priv. - Res. Melrose; carpenter; 37; enl. Aug. 1, 1862; must. Aug. 10, 1862; must out June 6, 1865. G.F.W. Haines Swing Priv. - Res. East Dennis; sailor; 24; enl. Aug. 5, 1862; must. Aug. 10, 1862; must. out June 6, 1865. Horatio C. Knights Wheel Priv. - Res. West Roxbury; driver; 24; enl. Aug. 4, 1862; must. Aug. 10, 1862; must. out June 6, 1865 as Sergt. Res. Boston; student; 21; enl. Aug. 2, 1862; must. Aug. 10 1862; must. out June 6, 1865. Medal of Honor man - date of action, July 2, 1863at Gettysburg, Penna. "Rescued his wounded captain from between the lines"
John W. Byrnes Private Residence -East Cambridge; clerk; 24; enl. July 30, 1862;must. Aug. 10, 1862; disch. Sept. 4, 1863, for disability at Boston, Mass. John J. Barry Private Res. East Boston; clerk; 18; enl. July 22, 1862; must. Aug. 10, 1862; must. out June 6. 1865. Henry Packard Private Res. North Bridgewater; bootmaker; 36; enl. July 23, 1862; must. Aug. 10, 1862; must. out June 6, 1865. Alfred A. Spalding Private residence - North Bridgewater; shoemaker; 19 [born 1844]; enl. July 22, 1862; must. 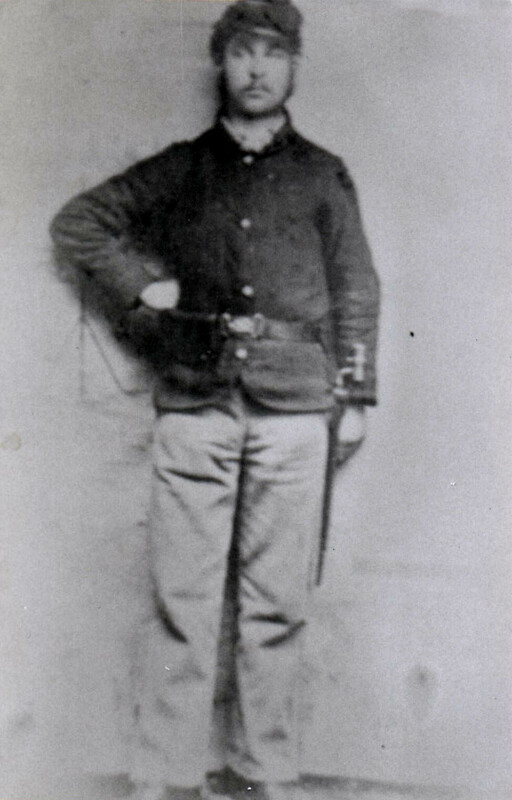 March 4, 1863; disch for disability, March 25, 1864 at Washington D.C.; 13 Vet. Res. Corp - Sept. 12, 1864 - July 28, 1865;Date of Death: April 7, 1895. Charles L. Sawin Private Residence - Orange; seaman; 25; enl. July 23, 1862; must. Aug. 10, 1862; disch. Dec. 30, 1862, for disability, at Washington, D.C.
Charles Simmings Private Residence - West Roxbury; carpenter; 28; enl. Aug. 4, 1862; must. Aug. 10, 1862;must. out June 9, 1865; cause of discharge: end of war. George W. Stafford Private Res. Lawrence; clerk;22; enl. Aug. 2, 1862; must. Aug. 10, 1862; died. Nov. 1862, of disease, at Washington., D.C.
Gardner Garey Private Residence - Charlestown; mechanic; 37'nl. Aug. 1, 1862; must. Aug. 10, 1862; must. out June 6, 1865.